My Photo Stream vs. iCloud Photo Library: What's the Difference? What is 'My Photo Stream'? And Should You Be Using It? Is My Photo Stream different from iCloud photo library? My Photo Stream is a feature on your iPad that allows you to share the most recent photos between all of your iOS devices. This means you can take a photo on your iPhone and view it on your iPad without worrying about manually copying the photo yourself. When you take a picture while My Photo Stream is turned on, the photo is uploaded to the cloud and then downloaded to your other devices. If you are a little confused by Apple's photo sharing features, join the crowd. Apple's first attempt at a cloud-based photo solution was Photo Stream, which uploaded all of the photos taken by your iPhone or iPad to all other iOS devices connected to the same account. 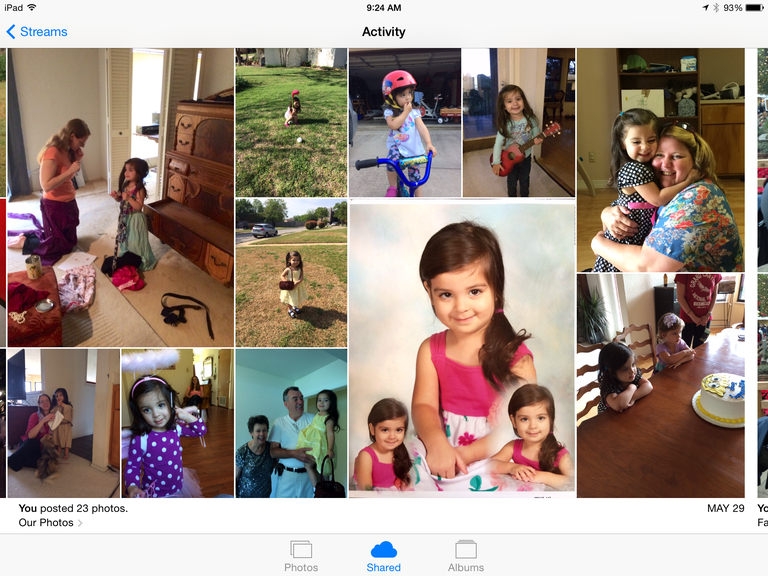 After a few years of being an imperfect solution, Apple introduced iCloud Photo Library. But instead of replacing and building upon Photo Stream, Apple left the older service in place. What is 'the cloud'? We hear it mentioned often these days, but it can still be confusing to those that don't know the jargon. The 'cloud' is just a fancy way of saying the Internet. So when you hear 'iCloud,' you can translate it to Apple's carved out portion of the Internet. More specifically, photos are uploaded to a server at Apple via the Internet and then downloaded to your other devices from this server. "Shared Photo Stream" is a feature Apple introduced after My Photo Stream. Instead of uploading every single photo taken, you can choose which photos to share to these private photo streams. This allows you to cherry pick the best photos and choose which friends and family can view those photos. My Photo Stream has a limitation of keeping only the most recent photos that were taken within the last 30 days up to a maximum of 1,000 photos. The shared photo stream doesn't have a time-based limitation, allowing you to share photos and keep them indefinitely. However, it does have a cap of 5,000 total photos. The shared photo stream has been rebranded as iCloud Photo Sharing. How Is Photo Stream Different From iCloud Photo Library? Believe it or not, there is a method to Apple's madness. While similar, Photo Stream and iCloud Photo Library function in a slightly different way. So while one might be the best solution for you, it may not be the right solution for everyone. iCloud Photo Library is similar to My Photo Stream in that it uploads photos to the cloud and syncs them across all iOS devices. It will also download photos to a Mac or Windows-based PC. And unlike Photo Stream, iCloud Photo Library also works with video. But the biggest difference between the two services is that iCloud Photo Library keeps a full-sized copy in the cloud and doesn't have a specific maximum number of photos and videos. However, because it takes up part of your iCloud storage limit, you can reach your maximum allocation. Because iCloud Photo Library is stored on the web, you can also gain access to your photos through a web browser. You can do this by going to iCloud.com and signing in with your Apple ID. You can also choose to reduce the amount of storage the photos and videos take up on your device by optimizing the photos on your iPad or iPhone. This keeps the full-sized photo on the server and a reduced-size version on your device. Can You Use Both My Photo Stream and iCloud Photo Library? Here's where it gets really confusing. Even if you have iCloud Photo Library turned on, you will have the option to turn on My Photo Stream. So you can, in fact, use them both at the same time. The big question is: do you really want to use both of them? iCloud Photo Library alone will give you access to all of your photos and videos from all of your devices. This would supersede the features of My Photo Stream in most cases. However, one reason why you might turn both on is to use them with your iPhone and only use My Photo Stream on your iPad. This would give you access to the latest photos on your iPad without taking up the extra space of storing every photo you own on your tablet. Even in optimized form, this can take up some precious storage space. Another useful feature of My Photo Stream is the ability to delete photos from the stream without deleting them from the device. When you delete a photo from iCloud Photo Library, it is deleted from both the device and the iCloud. If you delete a photo from the "My Photo Stream" album, it will only delete the photo from the photo stream and you can keep a copy on your iPhone or iPad. This can be useful if you take a lot of screenshots or take photos for reference, such as taking a picture of furniture while you are shopping. You may not want these photos on every single device. What About iCloud Photo Sharing? The old Photo Stream Sharing feature was rebranded iCloud Photo Sharing to avoid confusion. Which is good because My Photo Stream and iCloud Photo Library create enough confusion on their own. But other than the name, Photo Stream Sharing has remained basically the same. You can turn it on via the iCloud settings in your iPad's settings app. It is located in the Photos section of the iCloud Settings and is the last option under My Photo Stream. You can share any photo in the Photos app by tapping the Share button and choosing iCloud Photo Sharing. Should You Be Worried About the iCloud Hack?